Digital images are made of small squares referred to as pixels. The resolution of an image refers to the number of pixels the image contains. When an image has high resolution, it is able to capture more fine detail with clarity. If an image has low resolution, it may appear blurry (“pixelated”) because it does not contain enough pixels to capture the detail. High resolution images provide you with more options in terms of cropping and printing, and adding your images to custom photo gifts. If you plan to print or enlarge your photos, try to photograph in high resolution. Most digital cameras default to high resolution, refer to your camera or smartphone manual for further information. 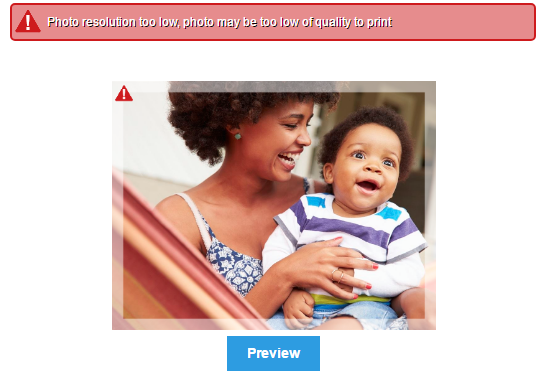 Due to the range of custom products offered by Sam’s Club Photo, each product has its own recommended photo resolution, which will also depend on the size selected. Many products, especially collage products, have numerous possible layout configurations. The recommended resolution for images that are used in these products may vary. If there is a resolution problem that will not produce ideal print results, we will display a low resolution warning.